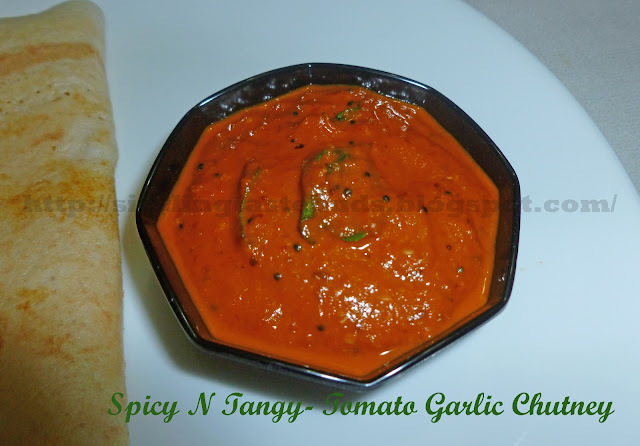 Tomato Garlic Chutney has an amazing flavors of tomato and garlic blending together with little(or little more) spiciness to give a totally different taste. I was in search of some new chutney recipe for my Oats dosa which definitely should be very healthy and should exclude Coconut. I got this recipe from Ramya's Recipe and fell in love with its lovely catchy color. Gave it a try the very next day and it turned out to be a super hit with my healthy Oats Dosa. Here's the recipe of Tomato and Garlic Chutney. 1. Slightly fry red chillies and keep aside. 2. Saute Chopped tomatoes till they become soft. 3. Fry Garlic cloves if needed (Frying is Optional). I kept this raw. 4. Make a fine paste of these garlic, fried red chillies and tomatoes to a smooth paste in a blender without adding water. Shift the chutney to a bowl and add salt and a pinch of sugar for taste. 5. Season the chutney with mustard seeds and curry leaves. Serve it with Dosa's (click on the link to check different Dosa variety) or Idli's .